Escape to Alcatraz…with Angel Island Ferry this season! Angel Island – Tiburon Ferry invites you to “Escape to Alcatraz” on-board an Angel Island Ferry Alcatraz Cruise Circling Tour by way of the Golden Gate Bridge. Cruise under the Golden Gate Bridge on an Angel island Ferry Alcatraz Cruise. Imagine yourself embarking on an exciting journey to the infamous island of Alcatraz by way of the Golden Gate Bridge. 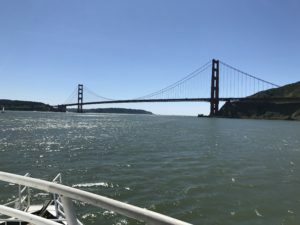 This 2 hour long Alcatraz Cruise adventure departs out of Angel Island – Tiburon Ferry’s Main street dock located in downtown Tiburon, California. From Tiburon, California, Alcatraz Cruises will travel to the Golden Gate Bridge, offering priceless photo ops for cruisers to capture memories of this world famous landmark to last a lifetime. Once under the Golden Gate Bridge,Angel Ferry’s Alcatraz Circling Tour takes you on an exciting journey around “The Rock,” which includes live narration delivering fascinating facts on Alcatraz Island and it’s world-renowned history. Book your Alcatraz & Golden Gate Bridge Cruise online. 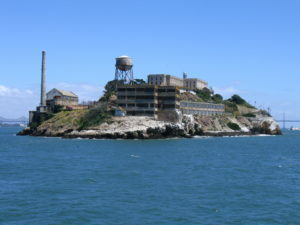 Escape to Alcatraz! Get an up-close view of the world’s most famous federal penitentiary via a ride under the Golden Gate Bridge. Departs from Tiburon, California, 2:30 p.m. – Returning 4:30 p.m. every Saturday starting June 15, 2019 through Sept. 28, 2019.